Those of my longtime readers will know that I very rarely if ever mention anything on this blog other than my ramblings on tech. But today is a very different day and I feel compelled to write about this. So I'll ask for a mulligan. And, as always, my views here do not represent anything or anyone other than me. I first moved to Alabama in 2000 to attend college at Auburn University. I came here in my parents footsteps, both of whom are also graduates of Auburn University. And although I was not born here, my family roots run deep in this state. My ancestors immigrated here from Prussia in the 1800s. There's an entire cemetery of my relatives on a plot of North Alabama soil near Florence and another in Conecuh County in South Alabama. Alabama blood flows through my veins. I never intended to stay here when I moved here for college. But 15 years later, sometimes to my dismay, I've built a life for myself here in Alabama. I paid out-of-state tuition here to receive a college education here, and graduated from Auburn University in 2004. I've gotten married and had a family here. I've been an employed, tax-paying, voting citizen here for 15 years. I've been involved in many civic organizations in my community and volunteered countless hours to make this state better. I've even started a business here. At this point, I have lived almost half my life in Alabama. This is my home. But, Mr. Moore, this state has a complex and often dirty history. And when I travel outside this state, I am constantly having to fight against the reputation our state has earned. In 1963, Governor George Wallace was in a position much like you. Thrust right into the hot forge of history in one of the most pivotal moments in this state's long, tortured timeline, George Wallace made a decision to come down on the wrong side of history. He created a giant public spectacle by standing in the door of the University of Alabama to prevent African American students from enrolling. Not only were George Wallace's views and actions repulsive, the famous image captured by Warren K. Leffler of U.S. News & World Report Magazine of Wallace's public spectacle was broadcast across the nation and around the world. And everyone thought, "This is what people in Alabama approve of. After all, they elected him." Mr. Moore, we are still dealing with this image. We are still dealing with his actions. We are still haunted by George Wallace's ghost today. George Wallace's actions still haunt and reflect on everything we do here and on everyone who lives here. Even people like me, who weren't even born then. Every time I travel to another state this is the lasting image people have of the state of Alabama. And it takes an enormous amount of my time and effort to overcome this image and everything that it represents. I have to explain the New South to people. I have to explain that Alabama isn't like this anymore, and that we have grown as a people. I have to explain how we're building rockets here, how we're creating new industries here, how we're on the forefront many exciting new discoveries. I have to explain all the good parts of living in Alabama - pointing to our economic growth, low cost of living, and our great outdoor opportunities. I have to do this because the image of Alabama people have is crystallized into this single moment in history. Fifty-two years later, George Wallace might as well still be standing there. I know this because, every time I tell someone that I'm from Alabama, I get that look, and then I have to have that conversation over again. I've been fighting this fight for 15 years, trying to change peoples' opinions of this state whenever I can, one person at a time, and I'm starting to grow weary of it. George Wallace's ghost, and what it represents, always peeks around the corner. This is an enormous public relations problem for our state, and it has verifiable economic impact. It costs us business. It costs us industry. It costs us economic growth and jobs. It has got to stop somewhere, and it needs to stop here. We are trying our best, from Mobile to Huntsville, to build something very special in this state. A brighter future for Alabama, filled with exciting jobs, new industries, economic growth and revolutionary discoveries. We are trying to build an Alabama where every person can be equally and individually valued. A unique, vibrant future for Alabama that our descendants can be proud of. One where my children and grandchildren won't have to have the conversations I do extolling the virtues of this state to overcome its dirty, tarnished history. But you are sabotaging that. Your actions and threats are endangering that cause and hurting the state of Alabama. I would respectfully ask that you stop and consider your position. Mr. Moore, I am not asking you to like gay people. I am not asking you to approve of them. I'm not asking you to preside over gay marriages. The Supreme Court has declared that marriage must be available to all - I am not asking you to approve of that, either. I'm not asking you to do anything other than obey your oath and the laws of our great nation, the United States of America. You took an oath to uphold the laws of this state and this nation, and I expect you as an elected official to honor your oath, even if you don't agree with the laws you are required to follow. And, I would remind you that we have a a process in place already to deal with Supreme Court decisions that you don't approve of and you are more than welcome to try it. Athough, I would warn you, public opinion would be against you. But willfully and openly defying the Supreme Court of the United States is a chapter in our history that Alabama does not need to repeat. It didn't end well the last time someone from Alabama tried it and we are, and rightfully should be, past that. In short, all I'm asking you to do is not hurt and embarrass Alabama any further by openly defying the Supreme Court. We are good on the hurt and embarrassment. We have had enough of that to last a good long time and we don't need any more. Please don't add yet another shameful chapter to Alabama's history. In his final years, George Wallace recanted his views and asked for forgiveness from African Americans. And rightfully he should have because at the time his views were repulsive and they have only become more repulsive with time. But the people of Alabama are still living with George Wallace's actions and everything that he stood for. 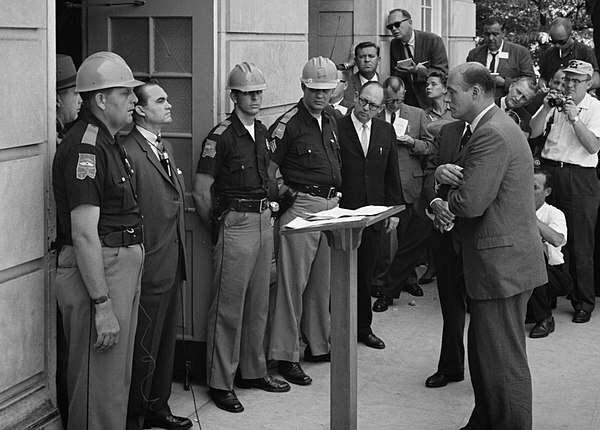 For so many people, their image of our state - their only image of our state - is George Wallace standing in the schoolhouse door. Mr. Moore, much like George Wallace, you are in the hot forge of history right now. And like George Wallace, you have a decision to make. But importantly, you have an opportunity, right now, to learn from George Wallace's sins and skip that step. To skip waiting 35 years to ask for forgiveness on your deathbed, before history remembers you the same way it remembers him. You have the opportunity to spare the state of Alabama further embarrassment, further infamy and futher economic and social damage. Most importantly, you have an opportunity, right now, to do the right thing and obey the law. Please, for the good of our state, make the right decision. Edit June 29th: WOW! This post has really taken off! It has roughly multiplied the traffic to my simple little tech blog by 20 times! The point of this post is not to discuss gay marriage. Take gay marriage out of it and replace it with any other issue and it would be the same. It’s not relevant what you, I or Roy Moore thinks of the gay marriage verdict, although I do support it. The verdict exists. It is law now. What I don’t want is Roy Moore openly defying a superior court and bringing further shame on Alabama. We’re past that now. If he (or you) disagree with the verdict, there is a proper, legal way within the framework of our government to address it. And he (and you) are welcome to attempt to follow Article V of the Constitution. But good luck. It’s only happened 27 times in 228 years. For the time being, I am leaving comments on. But I will warn you, I am heavily moderating them and banning as appropriate. Disagreements, constructive criticism and discussions are always welcome, but mean-spirited and off-topic comments will be removed and the offenders banned. This means no racism, no sexism, no homophobia, etc. If you wouldn't say it to your grandmother's face, don't say it here. Remember, this is my blog and unlike in public society, you do not have freedom of speech here. Media enquiries: Please use the contact form to contact me. I am available for select interviews but I am a working professional first and foremost. My blog is a hobby, so any interviews will need to be worked around my schedule. I will be happy to answer questions via email though! Blanket permission is given to republish this article to any media outlet, provided the following conditions are met: 1) it is published in its entirety, with no editing, 2) send me a link to the article once you have published it, and 3) not required, but linking back to this post would be greatly appreciated.